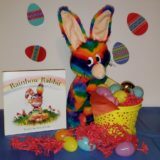 Rainbow Rabbit’s colors always shine bright, but with Easter 2019 taking place on Sunday April 21, it’s just another reason to give your child the gift of kindness and caring in their Easter basket! Rainbow Rabbit has put their generous grant from Walmart to good use by donating the program to Holy Angels Catholic School in Woodbury, New Jersey, which was seen on SNJ Today. As the year draws to a close, Giving Tuesday 2018 kicks off the charitable season on Tuesday November 27th, and Rainbow Rabbit is once again joining the global day of giving. In addition to our Anti Bullying/Kindness Programs, Rainbow Rabbit is proud to announce the addition of school presentations to our expanding curriculum. Win An Educational Program For Your School From Rainbow Rabbit! In continuing our recognition of National Bullying Prevention Month, Rainbow Rabbit is proud to announce it will once again donate one educational program to a learning institution! Last October, team Rainbow Rabbit wanted to give back during National Bullying Prevention Month by providing a school the chance to win their anti bullying program. The winning school was Upper Pittsgrove Elementary School in Monroeville, New Jersey. And after the team personally visited the school to deliver their anti bullying program, it was obvious that there couldn’t have been a more perfect learning institution to receive the honor. Woodbury, New Jersey – Rainbow Rabbit Educational Services Corp. has joined #GivingTuesday, a global day of giving that harnesses the collective power of individuals, communities and organizations to encourage philanthropy and to celebrate generosity worldwide. Win An Anti Bullying Program From Rainbow Rabbit! The Rainbow Rabbit Anti Bullying Educational Program is making an impact throughout the Delaware Valley and beyond. To date, the program has reached thousands of children, whose lives have been shaped by the colorful character’s lessons of kindness and caring. Now, during National Bullying Prevention Month, you have a chance to win the program for your school, your child’s school, or a learning institution! Back to School Freebies Courtesy Of Rainbow Rabbit! By this time, many students across America and beyond are returning to school—and Rainbow Rabbit wants to give you some back to school freebies! Happy Easter Wishes From Rainbow Rabbit And Friends! Easter and Rainbow Rabbit: Perfect Together! Of all the holidays during the year, it’s obvious for several reasons that Easter is Rainbow Rabbit’s favorite!